Aluminum is a soft and lightweight metal which is a good electrical conductive and also has sound absorbing, shock absorbing, and anti-rusting properties. 3103 aluminum sheet is a non-heat treatable wrought metal with good cold workability.It has excellent brazability and solderability.It also has good weather resistance and corrosion resistance, can be up to 25 years do not fade. The uniform coating, color diversity, advanced electrostatic spraying technology makes the paint and the adhesion between aluminum sheet uniform, color variety, choose space is large. It is quick and convenient for installation. 3103 aluminum sheet can be recycled, is better for the environment. Aluminum sheet can be 100% recovery, is different from the glass, stone, ceramic, the adornment material such as aluminum, high recycling salvage value. Sino East supply 3103 aluminum sheets with the thickness of 0.200-6.0.It has the temper of O, H14, H24, H16, H26, H18. The width is approximately 900-190025-1900. 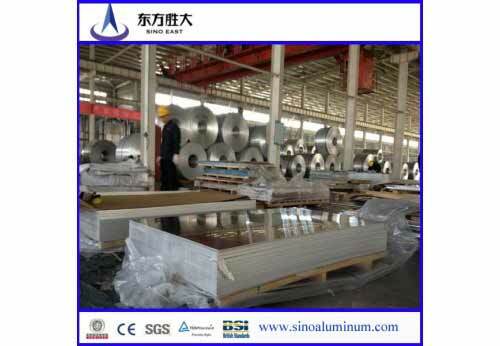 Sino East is one of professional aluminum sheet suppliers that our company had built the quality supervision department and aluminum lab to control the quality of production which will export to other countries. If any further questions, please feel free to contact with us. We will reply you in 24 hours after got your inquiry by email, please make sure your email is available and remember check inbox.